When French film star Brigitte Bardot chose to wear a gingham dress for her second wedding in June of 1959, she couldn’t have known how she would become so associated with that fabric. 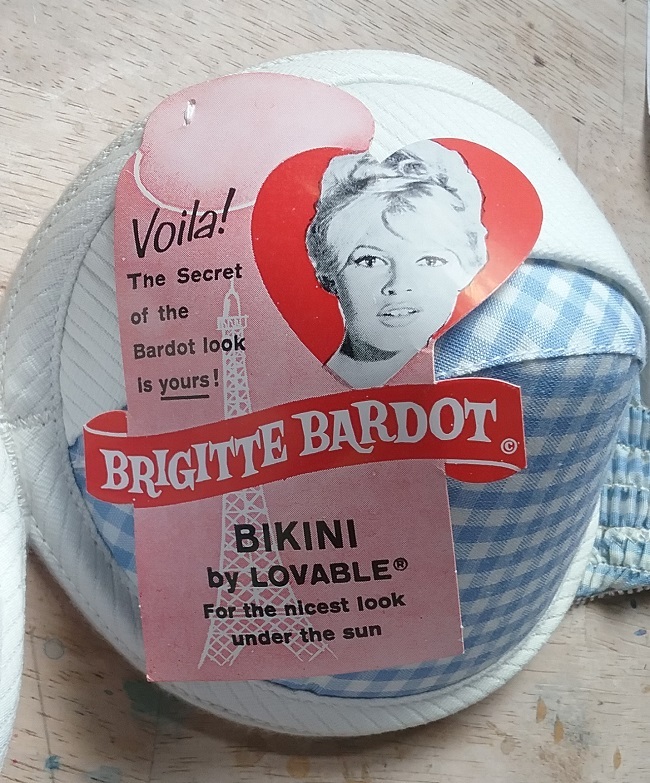 The dress was pink and white, but that didn’t keep Lovable from using blue and white gingham in a Bardot endorsed bra top. The dress itself was widely copied, and still is today by companies that make modern “vintage” looks. When the sexiest actress in France chooses a fabric, the whole world takes notice. I posted a photo on Instagram, and a reader commented that this was actually the top to a bathing suit, and that she had the entire set. The word “bikini” on the label does tend to suggest that there was a bottom piece, and that it was intended as a swimsuit. 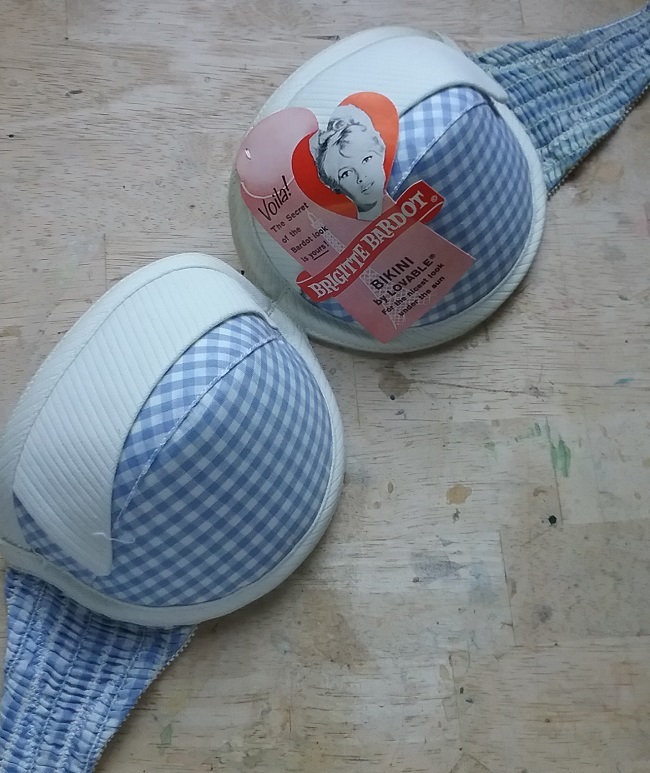 Loveable was a bra company located in Atlanta, and I have written about it in the past. It’s a great story, and if you haven’t read my old blog post, it might make you feel good to do so. I have never encountered a Loveable bikini before, but who could resist the opportunity to produce a garment which featured Bardot? 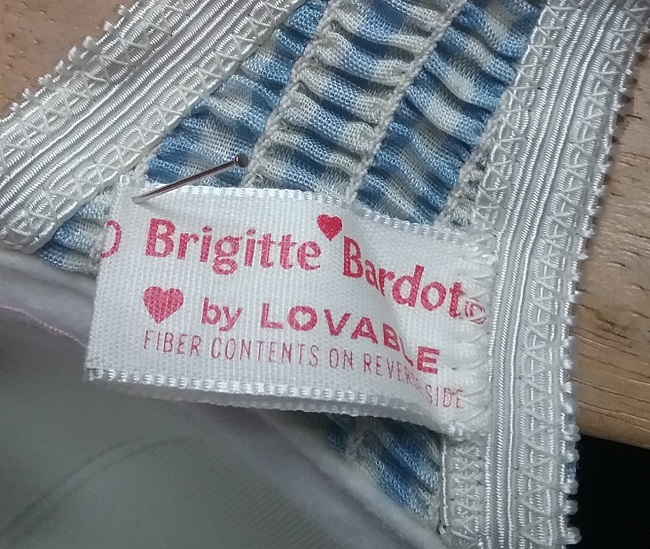 I was happy to get the bra with the original paper tag intact, but even if it were missing, Lovable kindly put Bardot’s name on the label. So many times the connections are lost when the paper tags are removed. The Lovable Brassiere Company is no more, and Bardot is now known more for her animal rights activism than for her career as an actress. But somehow the connection between Bardot and gingham lives on. This bra came from Ballyhoo Vintage, one of my favorite online vintage shops.